Yesterday I went to my first CAMRA beer festival as a fully paid up member. It’s taken a long time for me to become a member of CAMRA for several reasons, one being that CAMRA has a stereotype that can’t be denied and, as a young female drinker, it can seem quite intimidating. In the end I decided to go for it as a way of getting to know my local drinking holes a bit better (living in London it’s so easy to just go straight into town all the time) and, of course, you can’t criticise and judge something unless you’re a part of it. If we want change, we must be part of that change! For my first half I decided to play it safe and go for a blonde beer. It was drinkably good with hints of fruit, but no bitterness whatsoever and a bit watery for me. I’ve had worse, but I’ve definitely had better. A golden ale this time chosen purely on name alone as the one I wanted wasn’t on yet. Aroma wise this was more promising with toasted malts and a sugary sweetness. Taste wise though I’m not sure if this followed through; it was fairly sweet with a good balance of bitterness and a dry finish. Definitely drinkable, but perhaps not as memorable as I was hoping. I’d been lusting after a Sirius Dog Star ever since I’d checked out the beer list and seen its completely vague description that gave nothing away. That, coupled with its completely unrelated name, meant I had no preconceptions before tasting. At first glance I was impressed by the deep ruby black and was pleasantly surprised by the dark fruits and caramel aroma. Still, I’ve been fooled by a tasty aroma before leading to nothing but blandness; not so in this case as it was packed full of berries, chocolate and a hint of bitter coffee. Next time I see this on tap I’ll definitely upgrade to a full pint. I should say that I met several members of the West Middlesex CAMRA committee last night and they were all incredibly welcoming, so some of my fears have certainly been laid to rest. Watch this space for more CAMRA related action! 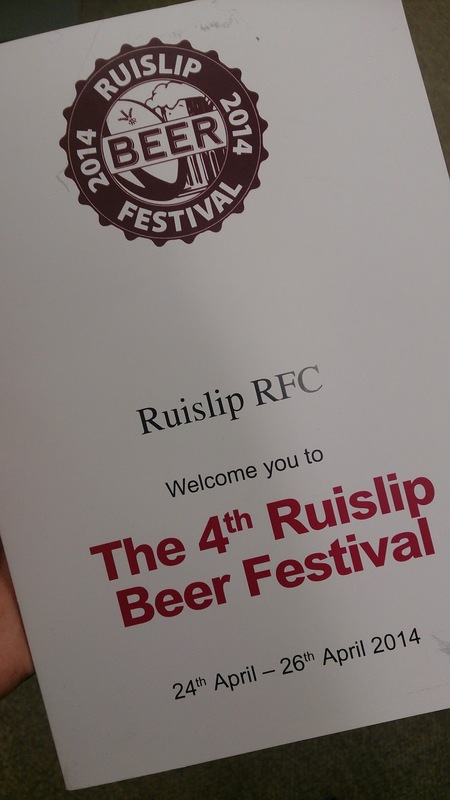 The Ruislip Beer festival is running until Saturday 26th April between 12pm and 10:30pm.